. Published on October 9, 2018. A great business website is all about dialogue. Interactive, visually striking, engaging content is what fosters that dialogue and removes the screen barrier between you and your client. But as an entrepreneur with a ton of tasks and seemingly never enough hands, choosing the best website builder for small business among the dozens of ‘top’ ones can seem like one more mountain to climb. In reality, all you need is to know the strengths and priorities of your business. Depending on your needs, we’ve selected the 5 best website builders for small business and 1 great customer service to make sure you’re always a phone call away from the clients who need you most. Now, once you’ve set your priorities, let’s take a look at some of the best platforms for different business needs. Doing things the right way from the start is your simplest path to peace of mind in the future. Keep in mind that WordPress has two platforms: the full-featured WordPress.org and its sibling WordPress.com. It’s the former that you’ll want as your website builder for small business. Did you know WordPress.org is the platform global giants such as The New Yorker, Sony, Bloomberg, and Facebook Newsroom use to host their sites? You’ll be in good company with WordPress. With all your competition, you can’t underrate the importance of Search Engine Optimization (SEO). If you still have trouble figuring out how to apply SEO in practice, we suggest WordPress do it for you. Highly optimized for search engines, WordPress also supports great plugins like Yoast SEO which ensures that your content never stays shut off from the wider world. WordPress offers countless e-commerce opportunities for beginners and advanced users alike. The number of plugins alone–over 50k – is amazing. What’s more – a great deal of them are free. WordPress gives you total control over your site. You can switch templates as well as download and export your content anytime. If you plan on expanding your business and are looking for a platform that you won’t outgrow with time– look no further. Being an open-source, free software (you only pay for domain +hosting), WordPress.org doesn’t give you control over its latest developments and functionality. That means you’ll have to update your site regularly to have all the latest security features and backup your data manually. It doesn’t get easier than this. Wix has made creating a website as simple as having a short chat about your business with its Artificial Intelligence assistant. For those more in the know and prepared to do the job themselves, Wix Editor (for intermediate users) and Wix Code (for developers) provide all the necessary tools to build a site. If you need an e-commerce option, you will have to buy a special Store Plan. With Wix, you can relax and forget about manual updates. Both security issues and updates are handled by the site. Once you’ve chosen a template on Wix, you’re pretty much stuck with it. Wix doesn’t allow you to export content to a different template, or, for that matter, a different platform. This means that if you decide to download and move your site to a different web builder later on, or even switch templates, you’ll have to manually rebuild all your content. For everyone who’s strong with design skills and has lots of impressive, high-resolution images of their business to showcase, Squarespace is definitely a great pick. It may take longer to adapt to all the possibilities and customize the templates to your wishes, but if your priorities are to stun clients with incredible, professional images that are going to magnetically attract them to your business, Squarespace may be the match for you. Providing its own hosting, Squarespace takes care of issues such as data export, security and speed. With all those high-resolution images interfering with load time on many platforms, you’ll be extra thankful for the speed boost. Squarespace only supports its own apps (which come as part of the package). If you plan on using special extensions and apps for your business, it will not be a convenient choice. Effective SEO will also require additional knowledge and work. Shopify is about giving online stores all the convenience they need. As a website builder for small business that’s 100% e-commerce oriented, it’s the best tool of its kind. 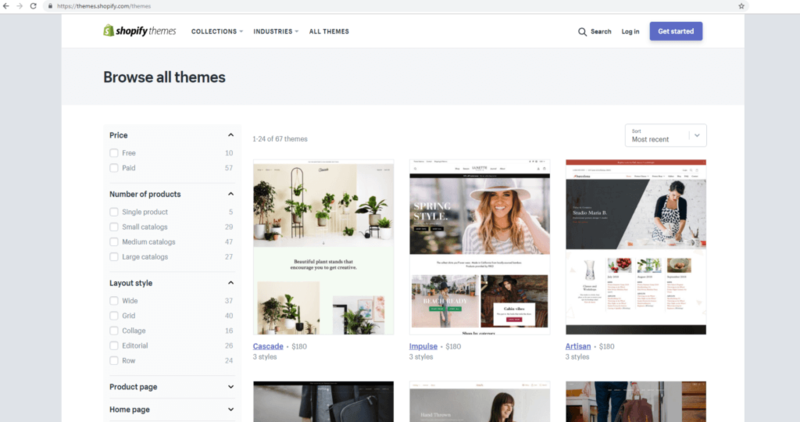 Choose from Shopify’s 100+ online store themes and then supplement your site with the right client apps (over 1,200 available). Plus, keep in mind that Shopify’s 24/7 support is always ready to save your (and your customers’) day. Shopify will make it easy for your customers to shop right from their mobile phones with their free, built-in mobile shopping cart features. Also, as Shopify lets you accept payments from 70 different payment processors in different currencies, it will easily take your business to the next level as soon as you’re ready to. Unless you use Shopify Payment, Shopify will charge a small percentage (0.5 – 2%) for transactions. These fees are additional to the monthly costs, but with all the features available to empower your sales, it may not be a lot to ask in return. An innovative new platform which made waves in the website building industry after its launch in 2014, Tilda is the perfect web builder in a literal sense: it makes breathtaking design as easy as stacking blocks. That’s because the Tilda Editor includes over 400+ text, image, multimedia, infographic, interactive, and other content “blocks” for you to drag and drop, stack, and fill with content. Take some time to play around with these blocks on your page and you might never return to ordinary site builders again. One of Tilda’s greatest features is called Zero Block. This awesome, one of a kind custom tool will let you manage typography, draw shapes, and even design animations. Tilda also offers good SEO, data management, and analytics possibilities, and as your site is stored in the cloud, there’s no need to pay for hosting. Plus, e-commerce is very well supported on this platform. Tilda uses the same “block-building” approach throughout. While this makes putting up visual and multimedia content super easy, it’s not so great for pages that are heavy on text. So if words are your greatest strength and you need a website or business blog with lots of written information, you should stick to more conservative options. When choosing the best website builder for your small business, pricing options should somewhat factor into your choice. However, there is no single right plan for everyone. It all depends on what stage your business is at now and where you plan to go. If price is your priority, we recommend going with WordPress or Wix. With WordPress.org you can pay as little as a few dollars a month for hosting, plus a small annual fee for a domain name. Squarespace and Shopify are geared toward more advanced users. Following free 14-day trial periods, Squarespace Business plans start at $26/month while Shopify will let you open an online store starting at $29/month + transaction fees. When selecting that one perfect platform and loading it with amazing content, your goal is to make customers interact with your business. But to do that, you need more than a great site. You must give clients a fast, modern communication tool to connect with you directly. At MightyCall, we love powerful simplicity. Unlike Virtual Phone System apps, which integrate with certain website builders but not others, our widgets are incredibly simple to use across all platforms. Just copy and paste the html code on your website and voila! – new customers will be just a phone call away. Watch your client list grow as customers contact you for free, directly from your site, with a single click. A convenient tool for clients who prefer to schedule a return call. 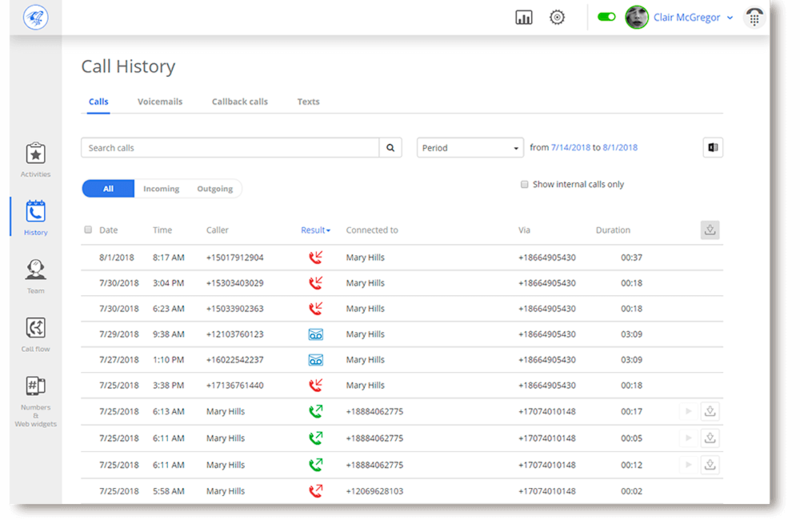 By specifying the timeframe of the call, you help customers do business quickly and neatly while skipping the frustration of waiting. In a world where time is our greatest value and a few seconds may be the difference between gaining and losing a client, taking an extra step always pays back. By creating an attractive, convenient website with just the right features needed for your business, you spark interest. To hold that interest and transform site visitors into returning clients, you must show exactly how customer-friendly and trustworthy your business is. And there’s no better tool for that than live communication. Is Telecommuting the Future? 5 Reasons why it should be.